Cunningham is the co-founder of Healthy Solutions, a fledgling Washington, DC-based organization working to bring awareness of black farmers to a national level, despite (or because of) the fact that they now make up less than one percent of all agricultural producers in this country. A former produce distributor who now works simultaneously to connect black farmers to markets while providing folks in low income neighborhoods with fresh produce, Cunningham and her group have named this week, July 10-16, National Black Agriculture Awareness Week. Black farmers made the national news near the end of last year when Congress, at long last, approved funding awarded in a class-action lawsuitfiled in 1997 by 400 black farmers. Pigford v. Glickman (known to many as “Pigford”) proved that black farmers had been denied grants and other support by the USDA on the basis of race. The case resulted in the US government agreeing to pay $50,000 to farmers who could prove they had attempted to get USDA help but failed. Furthermore, adds Cunningham, “A lot of people who are getting money are the heirs of farmers who are long since passed, and those heirs don’t have the tools or capacity to get back into agriculture.” She says she hears regularly from these heirs and other black land owners looking for support to begin growing food and existing farmers who work full-time off the farm and end up composting produce they can’t sell. That’s part why Healthy Solutions sets up farming trainings, works to engage youth in entrepreneurship programs in DC, and has established a cooperative for black farmers in the southeast. Here in California, black farmers are less common than they are in the Southern states. But farmer Will Scott, known for heading up the California branch of the African-American Farmers Association, hopes to see that fact change. His association formed originally when a group of farmers gathered to fill out Pigford claims together in the 1990s. 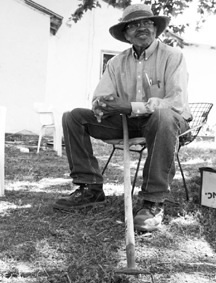 Today, he says, around 25 of the state’s 400 black farmers (from as far away as Bakersfield and Sacramento) have stayed engaged because they realize what a crucial moment this is — for farmers and the next generation of African Americans who run the risk of not seeing their culture reflected in contemporary agriculture. Access to land is a common challenge for young farmers, and young black farmers are no different. Brent Walker, 31, is a graduate of the Center for Agroecology & Sustainable Food Systems program at UC Santa Cruz, and — while he’d like to farm a large piece of land outside the city — he’s found a niche in Oakland. Walker farmed for the People’s Grocery and now farms on two small vegetable plots for a food justice organization called Phat Beets. The photo of Will Scott above originally ran in Edible San Francisco and was taken by Andrea Blum.